One small issue with LEDs is they have a different quality of light. We have measurements that worked well with Incandescent, HIDs, and Fluorescent lamps. CRI (Color Rendering Index) which gave us a relative measure of quality and CCT which gave us a lamp’s color temperature. But these measurements were based on factors that are no longer in play in the world of solid state lighting. In the July-August 2014 issue of Architectural Lighting, Alice Liao writes about the issues facing the consumer of quality lighting and the issues facing the professional user of lighting. After Lias discusses the short comings of these measurements, we’re introduced to the Color Quality Scale (CQS). Developed by the National Institute of Standards and Technology. The CQS tests with a broader range of colors, higher chromas and deeper saturation. I am hopeful the IES Color Metrics Task Group will come up with a simple scale for consumers who are already confused about LEDs. They should also develop a set of ratings for Professionals, whose requirements for light require more data not less. For those interested in this important topic, I highly recommend this article. The CIE chormaticity diagrams map perceived color. Lightness, the third dimension of the color space, is not shown in these two-dimensional graphs. The CIE created the 1960 Uniform Chromaticity Scale (UCS) to reduce the limitations of the 1931 system; it has since been updated by the 1976 UCS. 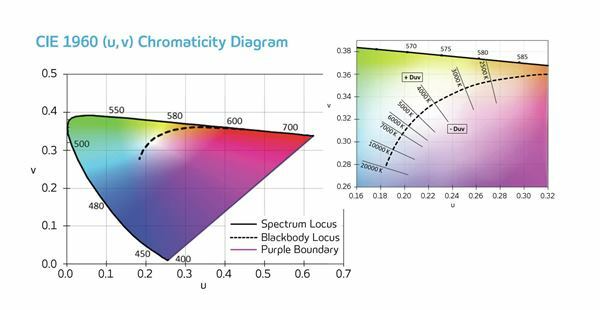 The Planckian, or black body, locus—shown by the curved lines within the filled areas—indicates the color that a black body radiator emits within each chromaticity diagram as it is heated up.